German civilians from Ludwigslust file past the corpses and graves of 200 prisoners from the nearby concentration camp of Wöbbelin. The US Army ordered the townspeople to bury the corpses on the palace grounds of the Archduke of Mecklenburg. Germany, May 7, 1945. 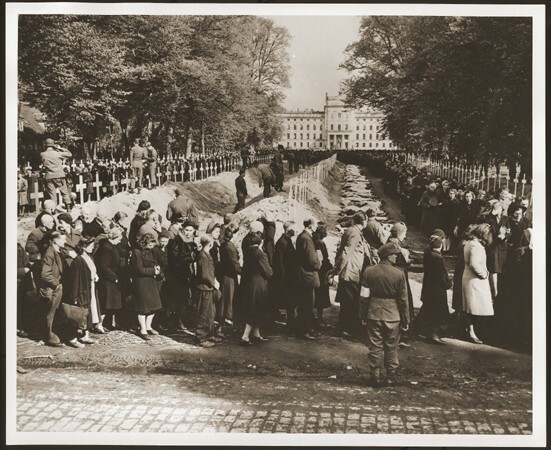 Outraged by what they found upon entering the camp, the ranking Allied commanders in the area forced civilians from the nearby towns of Schwerin, Hagenow, and Ludwigslust to view the concentration camp and then bury the bodies of prisoners in their towns.